The bigwigs at Amazon play by different rules than you or any other little guy does. Forget the little guy. Conglomerates and corporations alike have difficulty in keeping pace. Amazon and other major distributors’ bank accounts and business models allow them to go all-out on the sort of marketing strategies that see prices drop low -- too low for the conventional math to apply. It’s a dangerous line to walk, and every industry has their version of Amazon (Wal-Mart comes to mind). Amazon offers free shipping, shouldering the cost of moving merchandise to their customers. In a vacuum, this would slash their profitability and tank the entire operation -- they should be making less money than their competitors. In the real word, the company’s deep-pocketed approach is not only sustainable, but is held in place by world-beating client acquisition. In other words, they’ve got all the customers because their shipping platform is more attractive to online shoppers than the competition’s. The math is complicated, but ultimately Amazon is able to capitalize on their global supply and distribution network to absorb cost overages. In the long run, this actually benefits the company because it causes new business to constantly roll in. Consider the money they leave on the table with every transaction as a strategically sound marketing expense. It’s a calculated move, and it plays into Amazon’s hand rather well. A Walker Sands study concluded that 9 out of 10 online shoppers consider free shipping to be the primary incentive for buying online. For you it means one thing: offer free shipping or lose business. The impact this has had on you and the rest of the industry is nothing short of seismic. Just as Google’s bi-yearly public SERP algorithm updates cause chaos and panic across the SEO industry, the “mandatory free shipping” model looming on the horizon is causing quite a shakeup. It’ll be a make-or-break moment for countless businesses. Why all the concern? Simply stated, it’s scarcely profitable to offer free shipping. It’s not easy to make the math work on an operation like that. That’s why only Amazon and a select few others have implemented the policies successfully. Thankfully for you making money on free shipping is not impossible. It’s just very difficult and new. Keep in mind that people change, our economy changes, and the world keeps on spinning. Some e-commerce companies are starting to adapt, and others will join them soon. You need to do to adapt as well and find the way to become winner. There are a few white papers and case studies I wanted to share with you that present unique solutions to the problems Amazon have created with their success. Here’s a look at the prevailing wisdom of the past few research cycles, and some thoughts on how best to compete in 2017 and beyond. To remain competitive in the future, it’s worth considering what’s worked in the past. It just so happens that one of the oldest tricks in the book is still very much in play today, and in no way is this one limited to the shipping world. In fact, it’s one of the oldest tricks in the book involving transactions in general: watering down the product. 1. There’s a profit incentive -- There’s a behind-the-scenes calculation on whether or not money is still in the pipeline on an order with free shipping. If there is, the service is offered. If charging full price is the only way to avoid getting beat up on the balance sheet, free shipping is off the table. With this policy, you are only offering free shipping on items you can afford to ship for free. It’s as close to a zero-sum game as you can play on the margins. Pottery Barn is a great example for this approach. This week they offered free shipping, but they made it clear that the offer applied to specific product categories only. 2. The order was placed by some kind of “club” member -- Another way to shave overages and incentivize buyers to jump ship is offering free shipping to members only. This ensures buyers with high expectations can get what they need from a platform, which is ideal for client acquisition and retention. It also ensures you have some friendlier margins elsewhere on the balance sheet thanks to customers who pay full price. Target successfully uses this approach by offering the Target REDcard credit card. And, of course, one of the perks a client will receive is free shipping on regular deliveries. 3. The item is a return -- This one isn’t going to net you any consumer satisfaction reports because it’s not very enticing on its own. Still, it’s a way to trim some of the fat from transactions. By offering free shipping on returns only, buyers receive assurance that any mistakes or misunderstandings won’t happen on their dime. This is more than enough to win some folks over, and combined with other means of tightening things up, it’s a good way to offer a comprehensive returns policy. Lulus.com promotes its shipping strategy at the top of the home page, which is a great idea. A shopper knows what to expect as soon as they enter the website. 4. The product is already marked up-- This one’s ancient. If an item costs $10 and shipping is $5, it’s possible to offer free shipping on that item -- so long as it debuts at $15. This is a dangerous game to play. Packing shipping overages into the retail price of an item makes a platform less competitive at a glance. That means any window shoppers or folks who like to shop around for deals probably won’t bite. Kissmetrics presents a test that perfectly shows that the theory can be implemented and bring some great results - 26% improvement in net margin. Flat rate shipping can be a break in the clouds. Major freight movers like UPS, FedEx, and the USPS offer flat rates based on package dimensions and weight. Under this umbrella, you can easily calculate the shipping threshold (more on that in a moment), and can save heaps on logistics management. By utilizing a flat shipping rate, you convert your variable costs into static ones, allowing you to better plan and execute changes. “If it fits, it ships” – this is the rule of thumb for fixed-rate shipping arrangements. It’s easy to draw a line in the sand regarding which items can ship for free, and there are ways to get more bang for your buck. Some online businesses are becoming “famous” for including lollipops and other goodies with their shipments. For example, Johnny Cupcakes surprises some of his shoppers with not only unique packaging and products but also with additional items like mint gum, stickers, and colorful brochures. At first glance it’s a tiny present that costs a dime, but from another perspective it’s a very powerful present as it’s unexpected, has a personal touch, and I’m sure will leave a very good impression of the company. I personally like this approach, as it enhances the experience for buyers and is possible as a direct result of saving money on an order -- enough money to absorb the shipping overages and to include a small consolation gift to shoppers. It’s just an example, though. There are far more serious benefits of flat shipping. The results he shows using the flat shipping approach are amazing. 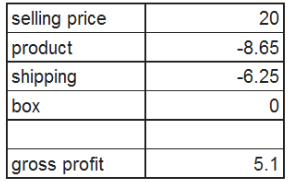 Scenario #1: Shipping price is determined by the shipping company’s rate. The product costs $1.73 a unit, the packaging costs $0.40 a 6 pack with packaging weighs just under 2 lbs, so freight across the country is $9.69 leaving a gross profit of $4.53. Scenario #2: Introduction of the flat shipping approach. The storeowner changed the sale to a 5 pack and lowered the price to $20 delivered to the end-customer, because a 5 pack fits in a Priority Mail Flat Rate Box, which costs $6.25. This lowered the cost for the storeowner from $4.16 delivered to $4.00 delivered and reduced the overall ticket, making it more attractive for prospective new customers. A shipping threshold is, at first glance, a business ploy that should have been doomed to obscurity the moment it was coined. Like a commercial for a sports car featuring zero information or imagery about the car that somehow gets viewers thinking about the brand, a shipping threshold is counter-intuitive. It seems like it couldn’t possibly work. Shipping thresholds are brutal in their efficacy, and we’ve all paid extra money to meet one in the past. Consider small-time groceries and corner stores. With so many low-cost items for sale, their margins aren’t always great. Gasoline is a good business to be in, but consider narrowing the focus to countertop purchases like chewing gum or, say, an air freshener for the rear-view mirror. As a cash purchase, things even out. Some folks use their credit cards for everything, though. It costs extra money to accept credit cards, meaning we may lose money ringing up that stick of gum and charging it to a customer’s card. Enter thresholds. The solution our corner store clerk needs is a purchase threshold for credit cards. In order to use their cards, buyers have to spend a set amount of money that makes the transaction worth it for the store. In the online retail world, this takes the form of offering free shipping, but only on orders where customers spend enough money to guarantee a profit. He also has some thoughts on how best to calculate the threshold number. Having a message prompt the customer to meet a shipping quota is an effective way to get bonus mileage out of the setup. “Spend an additional $63 to qualify for free shipping on your entire order!” works well. It sounds impossible, but NuFace increased their sales by 90% after implementing a threshold. Practice makes perfect. In his blog post about free shipping, Andy Hunt from Uplift identifies one key mistake that many online businesses make: they try free shipping, see no returns, and abandon the practice thereafter. There’s a hundred problems with this behavior, and a hundred more sayings waiting in the wings. “Rome wasn’t built in a day” comes to mind. Turning a profit on free shipping is a balancing act that requires time, patience, and practice to master. Often, businesses don’t practice enough. This is their key mistake. There’s no “one size fits all” business model vis- à -vis free shipping. Everyone does it a little bit differently, and that’s by design. It’s not an inherently friendly or easy business model to implement, and it’s not a snap-on piece meant to transform businesses overnight. Free shipping takes a tremendous amount of gumption to pull off, and that includes testing. Andy Hunt suggests making two different versions of the same website, each beholden to a different set of metrics. One version of the site serves as a baseline, while the other version plays host to whatever changes the retailer seeks to implement, and provides field data. If you are more careful in the implementation of testing and research initiatives, instead of trying free shipping policies on a whim, you will have more success in offering them. “A/B tests”, as they’re known, can paint a very clear picture of which steps to take next. It means that the resources you can draw from, whether they be yours or another entity’s, paint a portrait of what your actual value and abilities are. It makes sense, and we see it in practice often. We borrow money from banks and establish lines of credit to bolster our financial reach. According to this phrase, our bank is part of our network. Take a look at recent news. A woman accused of murdering her father’s children walked free after well-connected friends and family posted her bail, to the tune of $35 million dollars. Clearly, it’s all about who you know. This platitude applies to the shipping world in more than one way. Practically translated, it means leveraging networks to maximize value for customers. You can realize the actual potential and capabilities through the abilities of business partners, subsidiaries, and hired guns. This isn’t exactly revolutionary. With Amazon, it’s “been there, done that,” and they have. That’s because it’s the right thing to do, and a logical first step if you’re looking to keep your head above water in the coming years. One of the best ways to get the ball rolling here would be to take a look at fulfillment centers. The more of them there are, and the more spread out they are, the closer your network is to your customers, and the more streamlined the process of servicing them becomes. Prospective buyers in the South can enjoy free or low-cost shipping if there’s a fulfillment center open in Dallas. New Yorkers can expect the same luxury if your shipping network includes a facility tucked away upstate. This optimism isn’t feasible without spreading the business out and establishing touchpoints as geographically close as possible to your customers. Not only does network optimization knock the math of free shipping into considerably less insane territory, it’s also essential for establishing the quality of service required to compete. According to a survey conducted by Multichannel Merchant, this might be a problem. 654 merchants discussed the expansion of their networks, and the numbers weren’t enticing -- 75% of them run their entire operation solely from a “home base,” or one facility dedicated to handling all aspects of distribution. They’re leaving more on the table, too. Don’t be one of them. With a comprehensive fulfillment strategy that intelligently leverages your distribution network, you can get your products to customers faster, sometimes by a day or more. This increases customer satisfaction and loyalty – and it also increases savings. By paying the full brunt of shipping costs to service a wide-reaching customer base all from one location, you will spend tens of thousands of dollars (or more) in as little as a few months’ time, thanks shipping premiums. Without a leveraged network, nothing else is going to work. A great example of fulfillment implementation has been shown by one nutraceutical company (due to confidentiality, the company’s name is not provided). The key is getting off to a strong, informed start. Usually, businesses have more than enough data at their fingertips to last them twenty lifetimes. It’s just that they’re not using it properly. By conducting a comprehensive analysis of this data and finding a unique fulfillment strategy to capitalize on, you will see much better results than you see currently. We’re at an interesting crossroads in the shipping world. Amazon, which has always been a titan but is now more of an overlord of the market, has placed the onus on online businesses to step up (or off) by implementing an inclusive free shipping policy that, while expensive at face value, has helped them all but corner the market. With the rest of us playing catchup and scrambling for a competitive edge, there’s no telling what innovative solutions will pop up in the months and years to come. What does seem certain is that smaller e-commerce players are missing the mark by a country mile in terms of making the changes necessary to stay competitive. It’s not an easy goal, but the steps ahead are visible, if not crystal clear. It’s a delicate thing, though. It’s not as simple as “raise prices” or “open another facility.” Free shipping is a balancing act that requires constant tweaking and oversight, and one that’s only profitable if you have patience, savvy, and are willing to make a sacrifice or two in implementing it. The key areas of focus should be on network optimization, thorough testing, flat or occasionally free shipping, and adhering to a shipping threshold. If you are to focus on these five things (among others, of course), you’ll likely have more success in implementing free shipping policies that turn a profit. We’re all in the hunt for profitable free shipping together, so if you have your own thoughts, strategies, or feedback on making it happen, then I want to hear from you.